Today’s students demand choice—and that is as true of international students as it is of Americans. Immigration policy needs to be flexible enough to permit international students to avail themselves of the myriad educational opportunities that exist in this country. Rationalizing the Intending Immigrant Criterion Under current immigration law, applicants for student (F) visas must demonstrate to the satisfaction of the reviewing consular officer that they intend to return home after their course of study—i.e., that they do not intend to immigrate to the United States. Failure to prove this inherently un-provable negative constitutes by far the most common reason for visa denial for international students. And yet of course, both the applicants and the consular officers know that international students will have the opportunity under other provisions of law to apply for change of status in order to remain in the United States after graduation—and U.S. companies actively recruit them to do so. The reality is that some applicants intend to avail themselves of this opportunity, some don’t, and many have no specific intention one way or the other. 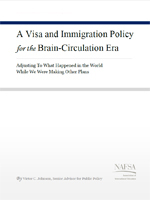 No public policy purpose is served by basing visa policy on the pretense that this is not so. The decision on whether or not students can become immigrants is best made when they actually apply for that status. For more information, including a summary, press release and a copy of the full report, follow this link.